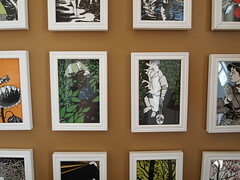 I love Nikki McClure‘s beautiful paper cuts. Her work graces several children’s picture books, including “To Market, To Market” and Cynthia Rylant’s “All In a Day.” While visiting my brother, Kyle, in New York City, I found a set of 15 postcards, each of a different McClure paper cut, titled Take Care at The Powerhouse Arena. I bought it. At Target I found small white wooden frames, for just a couple dollars each. I bought 12. They were originally arranged above cubbies filled with baskets filled with toys. This made sense to me, as I associate McClure’s work with children’s picture books and many of the paper cuts feature children. But then friends graciously gave us a piano—and the wall with the cubbies was the only place for it. 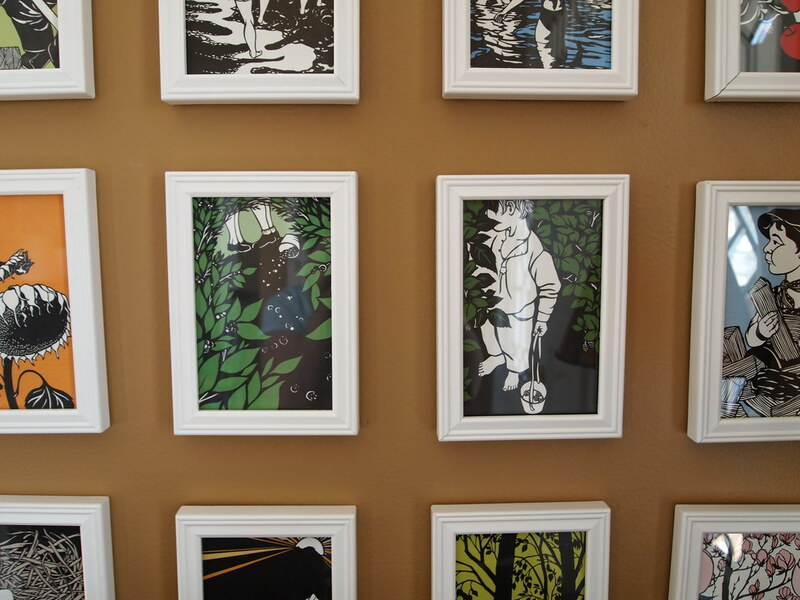 Still, I like the small framed paper cuts, above the piano. And it was an inexpensive way to fill empty wall space with work I love and memories of a wonderful weekend in NYC with my brother. This entry was written by kara, posted on April 1, 2012 at 10:45 pm, filed under Things I Love and tagged cynthia rylant, house, nikki mcclure, paper cuts. Bookmark the permalink. Follow any comments here with the RSS feed for this post. Post a comment or leave a trackback: Trackback URL.